Together we are building a democracy where every one has an equal voice. Curb the influence of big money in Oregon. We deserve a democracy where each of us is represented and has a voice and a government that works for every Oregonian, not just the wealthy few. It’s time to add much-needed balance to our democracy and enforce tougher rules to ensure politicians can’t be bought by the highest bidder. We need strong protections in our democracy so every voter’s voice is heard, and everyone’s voice counts equally. That way we can all have an equal say over the decisions that affect our lives. Otherwise, big money yells loudest, sets the agenda, and lets special interests rig the rules in their favor, with tax breaks for the wealthy paid for by cuts in education or health care for the rest of us. We need to strengthen our democracy so that our government works for all of us. In Oregon, we can have a system of government that is of, by, and for the people — a democracy where everyone has an equal voice and our elected officials are held accountable to our needs. But today, wealthy special interests and their lobbyists have thrown our system out of balance. They make the rules, they set the agenda, and they do it by drowning out the voices of everyday Americans. The size of your wallet shouldn’t determine the strength of your voice. Our democracy means we are all created equal and must have an equal voice. Working together, we are creating a democracy where everyone participates, and everyone’s voice and vote are counted equally — where everyone plays by common sense rules and we hold accountable those who break them. We all have a right to know who is trying to influence our elections and who lobbies or does business with our government. With more openness from the media and fact-based information that is trusted by voters, our elections will be increasingly fair and clean. And, our government will reflect our values and priorities because it will reflect who we are, how we live and work, and how we define America in the 21st century. 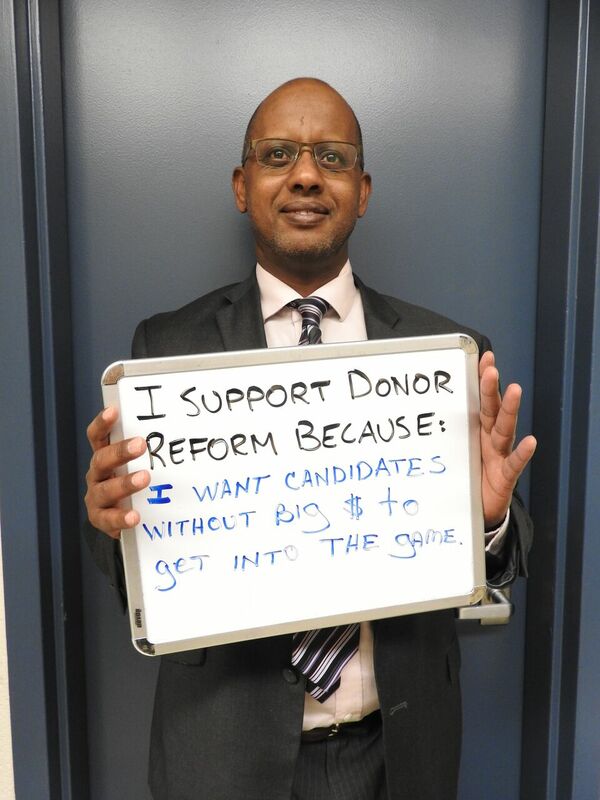 We must remove the barriers that prevent ordinary people from running for office. 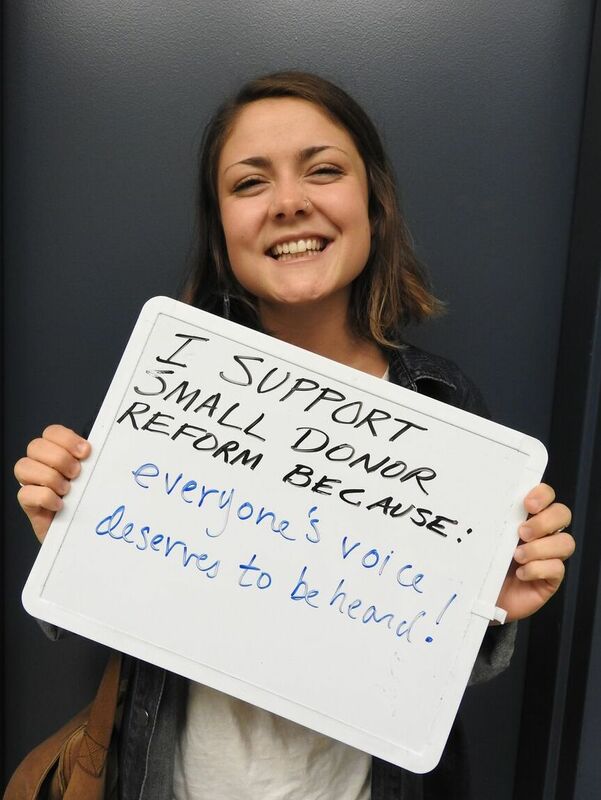 Proven reforms like small-donor public financing allow more Americans to run for elected office, without great personal wealth or becoming beholden to special interest donors. States and cities across the country are showing how to bring balance to our democracy, making it accountable to We The People. We need to create balance to our elections, and ensure everyone has an equal voice and equal say. 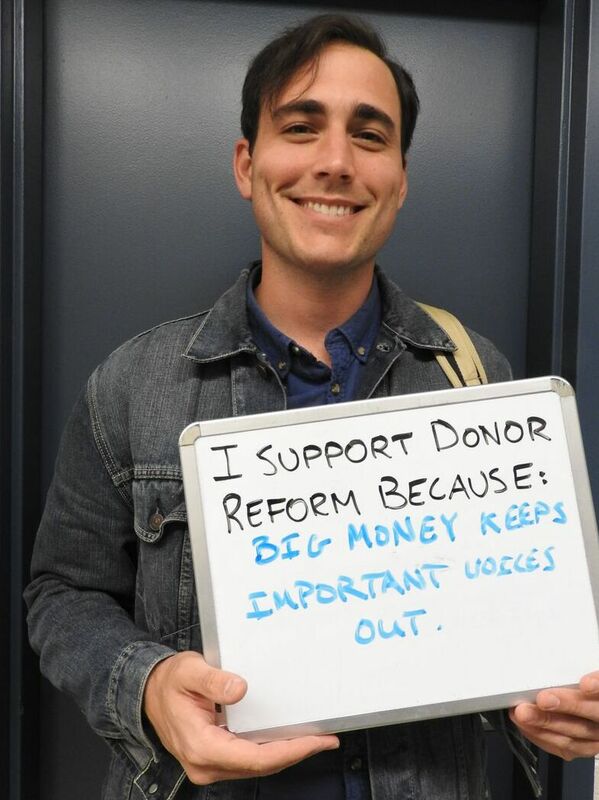 Providing matching funds to amplify the voices of small donors and ordinary voters through citizen-funded election programs makes candidates more accountable to, and dependent on, the people — not wealthy donors and special interests. Other potential incentives include limited tax credits and small dollar vouchers. States and cities like Connecticut, Maine, Arizona, and New York City have already shown these programs work and help lift the voices of ordinary voters in government.